In this Christ In The Storm tapestry we see a dramatic scene where Christ calms the stormy seas. In this dramatic work we see a gorgeous play of light as the sun illuminates a portion of the sky, as well as the ocean beside the ship, in contrast with the darm clouds and seas. The ship is about to capsize as Christ calls for the seas to be calmed in a miracle. The work is filled with beauty, and classic mastery of light and color, as the golds, oranges, browns and olives blend beautifully with some hints of blues. 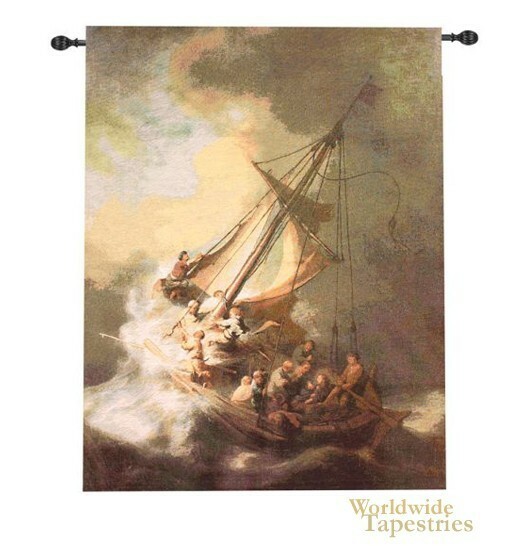 Christ In The Storm tapestry is backed with lining and tunnel for easy hanging. Note: tapestry rod, where pictured, is not included in the price. Dimensions: W 38" x H 49"